DS107 Frameless Shower Door Seal Replacement. 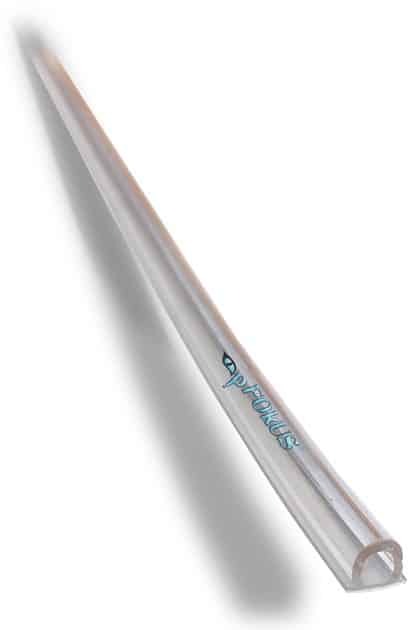 98″ long (8 feet long) for 3/16″ thru 1/2” glass. 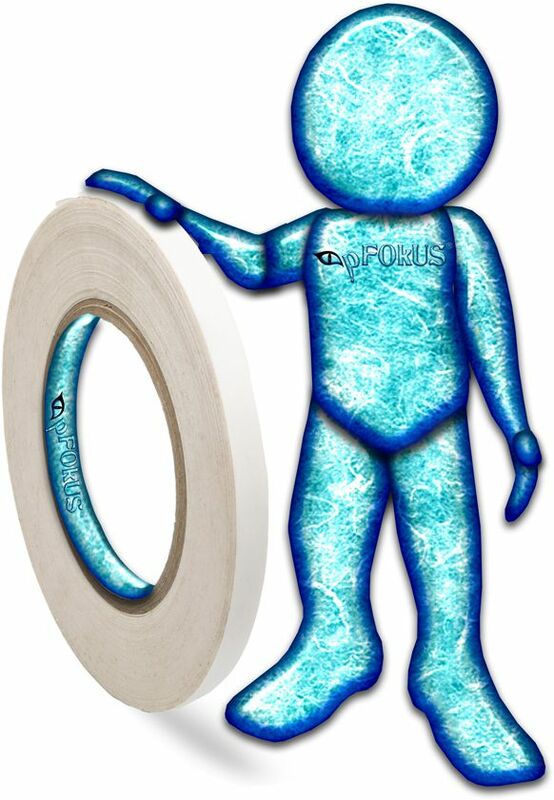 Comes pre-taped or the seal adheres with our DS200 double sided tape sold separate. DS107 frameless shower door seal is used for glass shower doors that swing in and out and also can be used on the front and backside of the door. The image to the left shows how the round bubble acts as a shower door trim between the glass shower door and the glass side panel. DS107 frameless shower door seal can be used on the backside of the door and it will seal between the glass and the tile preventing even the hinges from leaking. Pre-taped side seals are much easier to install. Purchasing our pre-taped shower door seals is the better route for the end user. Its easier to apply and less expensive then purchasing the tape. 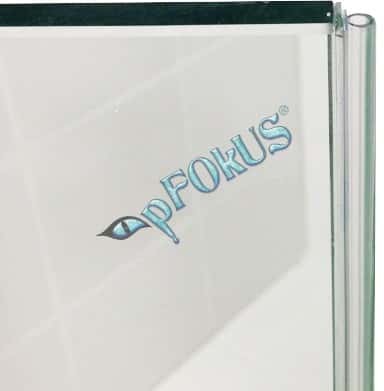 Our pFOkUS® 36’ waterproof double sided tape is made strictly for shower glass and side seals. The tape has elogation that sets the standard in the industry. 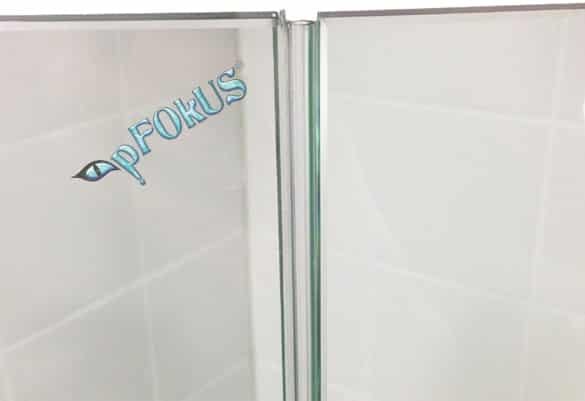 Before applying your new shower door side seal, we strongly recommend polishing your shower glass if water spots and etching have taken it over. 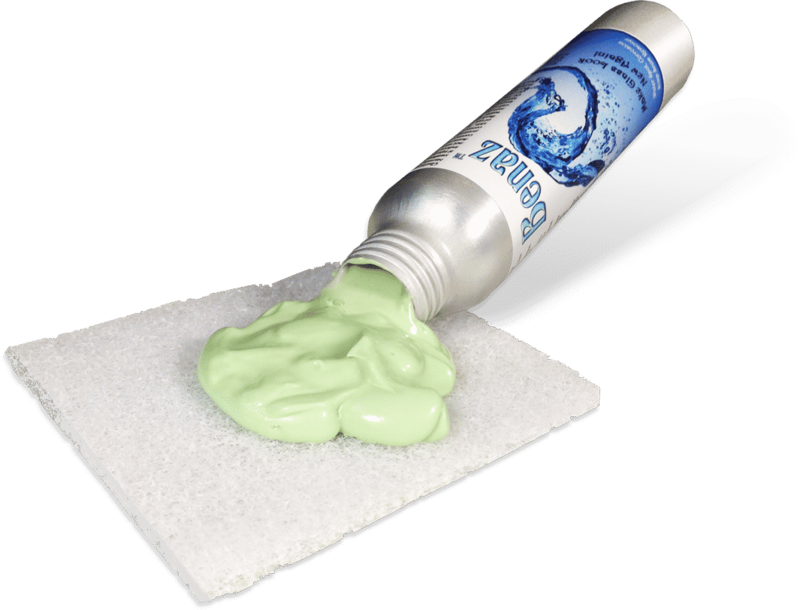 Benaz will remove the damage within seconds of application. 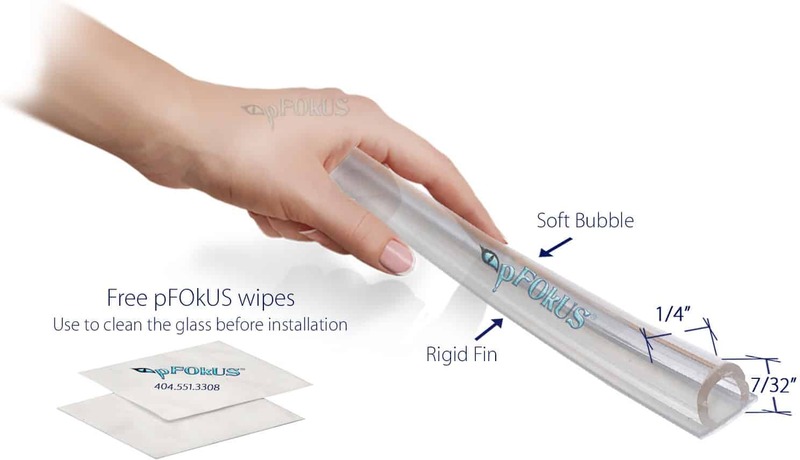 We understand that squeegeeing or wiping down your shower glass is simply not feesable with the limited time we have. Valore (cleaner and sealer), will not only seal the pores in the shower glass preventing water spots and etching, it will clean you glass as well leaving the glass with a lush shine. Valore creates a hydrophilic surface causing water to sheet off the glass instead of beading off. How do I clean the glass edge before installing the side seal? Is the pre-taped seal easier to install than the double side tape? Most defiantly the pre-taped is easier to install on the shower door. Scissors or a box cutter knife will work just fine. If calcium build-up is present on my shower door, how do I remove it? 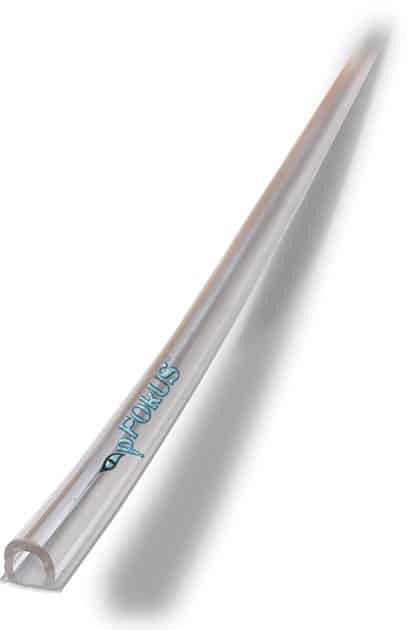 The calcium build-up on your glass can cause issues installing your sweep. 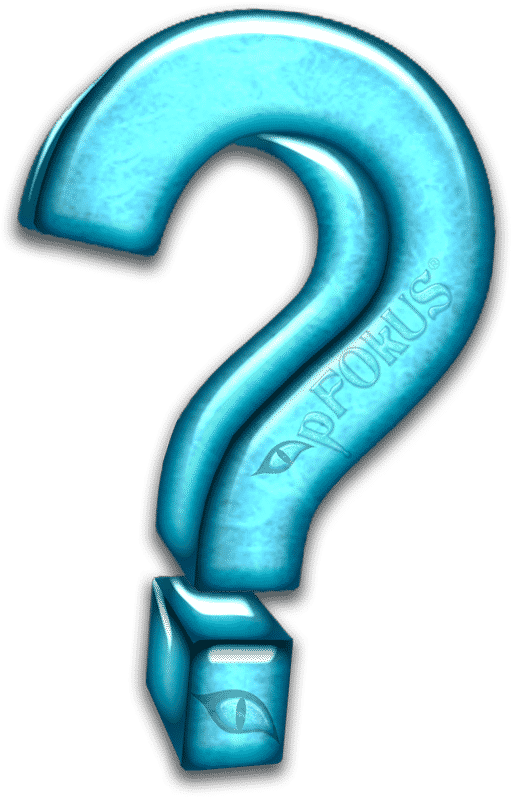 Depending on hard water and tiles with lippage – most sweeps should be replaced every couple years. Also depending if all oils are removed (with the pFOkUS pad that is included) before installation.